And, with the Blue Cat's PatchWork plug-ins chainer and multi effects processor, you can extend the capabilities of Axiom, with even more flexibility: host more plug-ins and build reusable parallel effects chains easily, or create rich synth patches for your backing tracks. 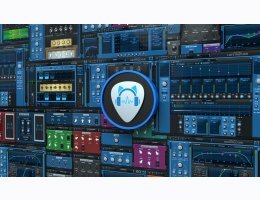 "The next generation: your axe beyond the limits" - Blue Cat's Axiom is a powerful and open multi effects processor and amp simulation software for guitar and bass. Based on the acclaimed Destructor plug-in for amp simulations, Axiom offers an infinite number of exceptional tones for your axe. "The distortion and amp sims factory that actually goes to 11" - Blue Cat's Destructor is a powerful distortion and amp sim modeling tool capable of simulating any kind of distortion: from harsh digital destruction to smooth compression or guitar amp simulation (works for clean tones too! ), and most importantly, yours! It is delivered with hundreds of presets and predefined models, and more. "The Creative Delay Workstation" - Blue Cat's Late Replies is a powerful delay and multi effects plug-in that can be indefinitely extended by hosting third party VST, VST3 or AU plug-ins anywhere in the signal path. With its unique topology, the plug-in is a full-featured delay machine with unlimited powers. "The virtual patchbay for audio plug-ins" - Blue Cat's PatchWork is a universal plug-ins patchbay that can host up to 64 VST, VST3, Audio Unit or built-in plug-ins into any Digital Audio Workstation (DAW) in one instance. It is possible to chain effects in series or create up to 8 parallel chains that can be activated independently.